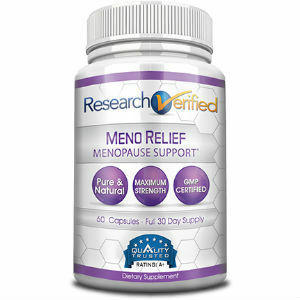 The purpose of this review is to analyze the Meno Relief product manufactured by Research Verified. After thorough research we’ve concluded that this supplement may be the best Menopause treatment available at the moment. The producer states that this product is supposed to help with various symptoms usually associated with menopause. It is said to be effective against mood swings and hot flashes. It is also great for dealing with the body’s hormonal imbalance while helping with night sweats, fatigue and insomnia. Keep on reading to find out more about the ingredients and dosage of this treatment. The capsules also have inactive ingredients like magnesium stearate and calcium carbonate. Keep in mind that the daytime formula also contains soy. When taken as a dietary supplement the daytime formula should not exceed the two capsules per day dosage. The label advises taking the capsules before a meal. The nighttime formula should be administered at night, one capsule before bedtime. Taking into account that the supplement has two formulas – one for day and one for night, it can be purchased separately as well as in a set. The price for a bottle of each is of $48. However, there are some pretty great discounts when the bottles are bought together. For example, a set of day and night formula will cost $80 ($16 discount), two sets will cost $116 and three sets will be $144. The thing is that the treatment is most effective if the customer takes both formulas, so these best value packages are great deals. Rarely have we found such a strong guarantee for a product. The manufacturer offers a 365 days full refund guarantee. Dissatisfied customers have a whole year to decide if this treatment is effective or not. If they decide against Meno Relief, all they need to do is return used or unused bottles so that they get a full refund. The reason this return policy and guarantee are so amazing is the fact that it makes customers more confident about those multi – bottle packages we’ve talked about. However, as far as we could tell, Meno Relief has no unsatisfied customers, since all the customer reviews were positive. In conclusion, when we looked into other similar products, we were unable to fine one as good and as effective as Meno Relief. The fact that all the ingredients have been clinically tested and that the purity in the capsules is the same as in the clinical trials is definitely amazing. Apart from that, all the positive reviews and the 365 days guarantee offered by the manufacturer make this product incredibly tempting. Jackie Horowitz	reviewed Research Verified Meno Relief	on November 23rd	 and gave it a rating of 5.